NASA suspects it could harbor an ocean — and maybe even life. And now, pending approval, we might soon get our best glimpse yet. 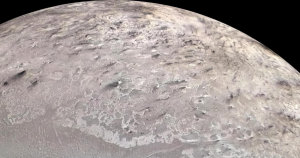 NASA’s Jet Propulsion Laboratory proposed on Tuesday at a conference in Texas to send a spacecraft called “Trident” to Triton — with the goal of sussing out whether it’s a habitable world. Rather than spending billions of dollars, the proposed spacecraft called Trident aims to keep costs low — roughly the “price of a small mission to the moon,” in the New York Times’ reckoning. Along with a Triton flyby, Trident would also visit Jupiter’s moon Io and stop by Venus — it’s been almost twenty years since NASA’s Cassini-Huygens spacecraft visited the second planet from the Sun. The last good look we got of Neptune was during a 1989 flyby of NASA’s Voyager 2 — the first time any spacecraft had ever done so.